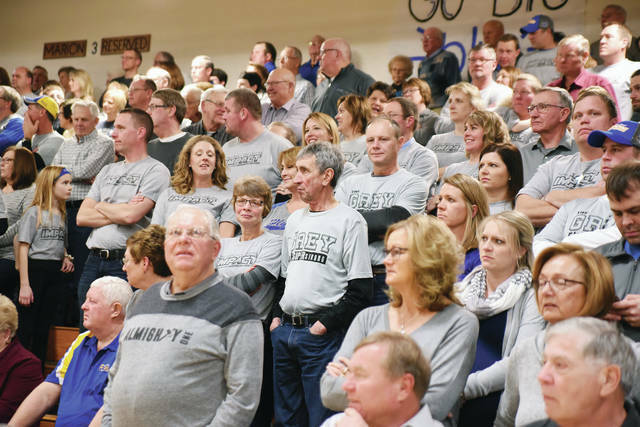 Fans adorned themselves with grey Impact T-shirts that honor Aaron Rose and Dan Thobe Saturday, Feb. 2, during a basketball game between Fort Loramie and Maria Stein. 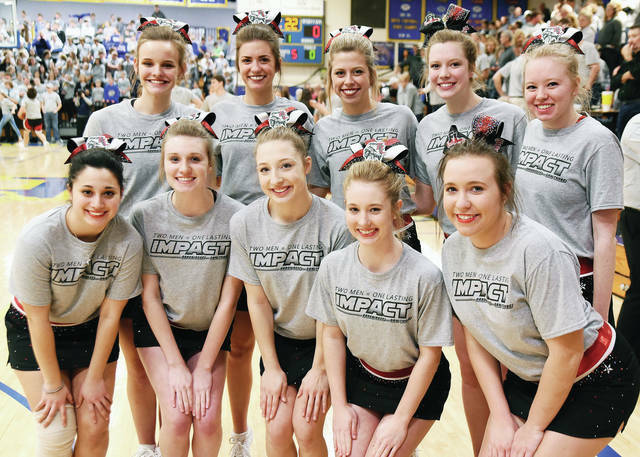 Rose and Thobe had both spent part of their teaching career at both school districts..
Fort Loramie cheerleaders adorned themselves with grey Impact T-shirts which honor Aaron Rose and Dan Thobe Saturday, Feb. 2. MARIA STEIN — The rivalry between Marion Local and Fort Loramie Schools took a time out Saturday night as both communities honored two men who impacted the students at schools. With Team IMPACT T-shirts — which state “two men = one lasting IMPACT — being worn by cheerleaders, basketball players and fans, the memories of Dan Thobe and Aaron Rose were honored. Fort Loramie boys basketball coach Corey Britton approached the Marion Local coaching staff earlier in the season about honoring both men. The grey of the T-shirt signifies Thobe’s battle with brain cancer. Thobe had taught math a Fort Loramie for four years before returning to Marion Local to teach junior high and high school math. He was a football coach at both schools. Rose was a sixth-grade teacher at Fort Loramie for many years. He left the district to take a job with the Mercer County Education Service Center. He was killed in a car crash last year. “Losing him to a car accident on the night of the biggest game of the year for both squads last year was terribly ironic, but we felt his presence that night and still today through the impact he made in both communities,” the Marion Local coaches said in a prepared statement. Each future basketball game between Fort Loramie and Marion Local will be known as the IMPACT game. A hammer signifying the impact the teachers made will be used as a traveling trophy for the winner of each year’s contest.